A Moment of Innocence opens with the arrival of an ex-police officer at the home of director Mohsen Makhmalbaf. It turns out that aside from being an actor looking for work, he is also the same policeman that Makhmalbaf stabbed in a botched attack in pre-revolutionary Iran (Makhmalbaf received a jail term for his crime). Makhmalbaf decides to film the restaging of this past action, using ‘separate’ camera crews to document how these two ‘antagonists’ direct the young actors who are to play them. The cinema of Mohsen Makhmalbaf is difficult to conceptualise and summarise (even the re-telling of his films’ plots can get pretty confusing). Whereas Abbas Kiarostami’s work is largely defined by a unity of style, theme and tone, as well as a mastery of mise en scène, Makhmalbaf’s oeuvre is much more schizophrenic and restless, routinely shifting in response to particular preoccupations and aesthetic considerations, as well as social and political conditions. Makhmalbaf’s cinema is also stylistically and tonally diverse, moving from more hysterical and straightforwardly committed (or angry) films like Marriage of the Blessed (1989) to more tranquil, glacial works like A Moment of Innocence. In fact, for those who are only familiar with Makhmalbaf’s earlier films such as Boycott (1986) or The Cyclist (1987), A Moment of Innocence will seem like a significant departure, closer to Kiarostami’s great Koker trilogy (in fact it shares many aesthetic qualities and views of the filmmaking process with Through the Olive Trees ) than to its seeming precursor in Makhmalbaf’s career, Salaam Cinema (1995). Though never totally regulated in style or mood, A Moment of Innocence still manages to communicate a palpably physical sense of its wintry environment, while also exploring the city of Tehran through its characters who travel down lanes or are shot in long take through the wind-screens of cars (which is also one of the dominant visual motifs of Kiarostami’s cinema). 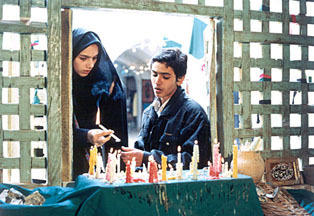 Nevertheless, whereas Kiarostami’s films in this mode are generally preoccupied with the transformative effect filming has on the world which surrounds it, and vice-versa, Makhmalbaf’s films are more directly concerned with the historical and cultural legacy, as well as everyday life, of cinema in Iran (see, for example, the wonderfully playful scene in A Moment of Innocence featuring a Kirk Douglas and John Wayne-obsessed tailor who discusses his own cinema-going exploits in Tehran). Whereas Kiarostami’s cinema is marked by the distance it keeps from its subjects, Makhmalbaf’s films are defined by a greater sense of immediacy, physicality and proximity. Not surprisingly, it is Kiarostami’s slightly atypical Close-Up (, documenting a remarkable true-life case involving a Makhmalbaf impersonator) that provides the closest prototype for Makhmalbaf’s films in this mode (which are generally more aggressively reflexive than Kiarostami’s). Thus, A Moment of Innocence can be seen as both emblematic of Makhmalbaf’s career and somewhat of a departure. A Moment of Innocence is, along with Gabbeh (1996), Makhmalbaf’s most formally controlled film (relying heavily on the alternation of lengthy, often parallel tracking shots and statically framed compositions). Critics often place it in a group alongside the director’s other, earlier films on cinema, such as Once Upon a Time, Cinema (1992), The Actor (1993) and Salaam Cinema, but it more accurately belongs to the trilogy of contemplative and allegorical works made by Makhmalbaf in the second half of the 1990s (with Gabbeh and The Silence ). Nevertheless, it does have some pertinent connections to Salaam Cinema, not the least of which is the central role it grants to one of the many hopefuls who are seen auditioning in the earlier film. But whereas Salaam Cinema endlessly chases its tail in its probing, though often quite comic, portrait of the autocratic power and control endemic in the mechanism and institution of cinema, A Moment of Innocence places a greater emphasis on the medium’s gentler nature, examining the potential it offers as a vehicle of reconciliation and catharsis. Makhmalbaf’s earlier films on the cinema deal more explicitly with the medium as a cultural and social institution, a public phenomenon in which the distinctions between cinema and everyday life, as well as the culture circulating around cinematic reception and filmmaking practice, are seldom clear or straightforward. But whereas Salaam Cinema opens with the extraordinary and sometimes quite terrifying footage of a throng of cinematic hopefuls pushing and shoving each other to gain entrance to Makhmalbaf’s studio, A Moment of Innocence proceeds from a far more ritualistic, matter-of-fact and measured encounter: the police officer, looking for acting work, is questioned by Makhmalbaf’s daughter (Hana), leading us into the story of the film that we are about to see (it therefore relies on a tension between the ‘actual’ and the restaged similar to that which structures Close-Up). The potential anarchy that is always hovering above Salaam Cinema is replaced by a more ordered and self-conscious aesthetic, punctuated by lengthy discussions between characters and the title cards and clapper-boards which formally break-up the film. Amongst the most remarkable qualities of the New Iranian Cinema are the ways in which it reorganises and makes us think anew the relationship between fact and fantasy, fictional narrative and ‘documentary’ realist cinema. This ‘relationship’ is at its most provocative in the many works of this cinema which represent the close proximity between everyday life and the everyday acts of filmmaking. It is a convention of this genre of cinema (the film-on-film) for a film’s self-conscious or reflexive qualities to cancel-out or question its ability to access and represent ‘real’ life (or reality, if you like). In contrast to this, many Iranian films within this roughly hewn genre highlight the very real connections between everyday life and cinema, seeing them as intricately connected rather than separate realms (creating, in the process, what could be termed a kind of neo-neo-realism). For example, in Through the Olive Trees, Kiarostami focuses on the staging and filming of a couple of scenes from his previous film, And Life Goes On (1991). But rather than erasing or questioning the veracity of the world both films represent, this approach helps to highlight and connect the quotidian qualities of both the world of the film being filmed and the ‘world’ which surrounds it. Similarly, Salaam Cinema plays on the less-than-clear distinctions that can be made between what can be considered the inside and outside of the film, and of what qualifies as either the subject of cinema or real life (and of what constitutes the cinema and what doesn’t). Part of the reason for this fixation (other than the history of such reflexive storytelling practices in Persian culture), is the prominent place cinema has in Iranian cultural and social life. This can be sensed in the fluid ways in which people/characters move from being documentary subjects to actors in A Moment of Innocence (it is often difficult to tell whether a figure is indeed acting or merely ‘being’ in the film). For example, in one scene two of the young characters comment on a woman who is begging off camera. Later in the film, we see a begging woman who is given bread by one of these characters. She then converses with the cameraman who, in turn, questions the legitimacy of her performance – the appropriateness and justness of his response questioned by the fact that she may actually be hungry, and is not just acting. But this fluidity is also the product of the framework that these films establish; films such as Salaam Cinema and even A Moment of Innocence examine the close proximity of cinema and everyday life, exploring a meta-cinematic and meta-realistic realm in which everyone becomes a potential actor. It is the slippage between character and actor, historical and fictional subject that is the most sustained preoccupation of A Moment of Innocence. The film follows and documents the relationship between actors and directors, as well as past events and their restaging (telling us much about shifting values in Iran in the process). Ultimately, it is the actor who is the recurring motif and subject of Makhmalbaf’s cinema. By restaging the ’emblematic’ events of the past, A Moment of Innocence expands the definition of acting to a wider circle of artistic, social, cultural and political actions. Everything becomes ‘performance’ in the film. As such, even a seemingly insignificant aside by the movie-loving tailor can take on a broader resonance: when speaking of not needing a role in Makhmalbaf’s forthcoming film – which his appearance paradoxically grants him – he cites his past ‘performance’ parading up and down in front of Teheran’s cinemas in the early 1960s as enough to make him a star. It is this intimate, ever-burgeoning and blurred relationship between filmmaking and film culture that is the ultimate preoccupation of much of the New Iranian Cinema. (This is despite the extreme anti-cinema prohibitions and rhetoric of the immediate post-revolutionary era, and even the initial banning of this film). Though aspirational and fabulist, A Moment of Innocence tells and teaches us much about the paltriness and lack of dynamism of such connections in most national cinemas.